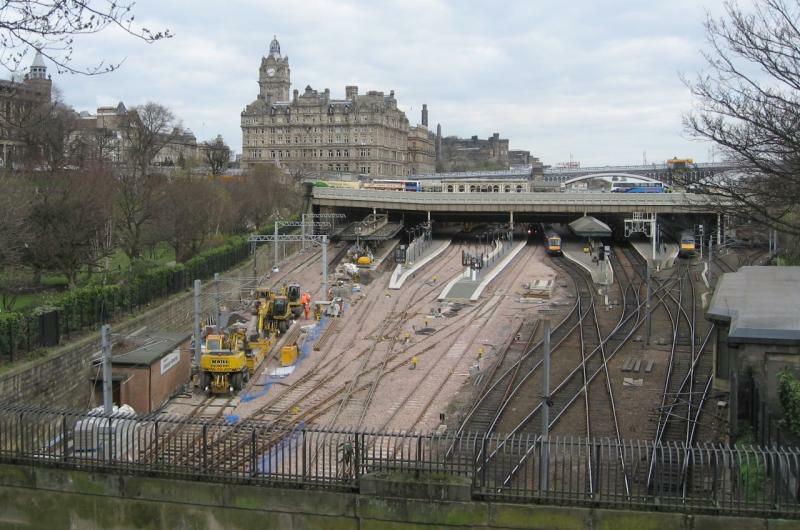 As part of Transport Scotland's investments work is currently taking place at Edinburgh Waverley to increase capacity and facilitate the introduction of electric services between Edinburgh and Glasgow via Bathgate and Airdrie. Other work will include cleaning, painting and repairing aspects of the station. Two Contracts were placed in December 2005. AMEC SPIE Rail was awarded a £24million contract to carry out track and platform improvements, and Westinghouse Rail Systems won the £29million contract to install upgraded signalling and telecoms. Work began in January 2006 and is expected to be completed by December 2007 when all platforms will be operational. Signalling:Edinburgh Nov 2007. Work started on the north side of the station, where a new platform face was constructed opposite platform 19 and platform 2. The North Loop and North Loop Siding were lifted, a new scissors cross-over was put in and a realigned North loop was laid. A temporary footbridge was erected in May 2006 to connect the station concourse to the Waverley Steps via Princes Mall, while the existing link bridge to the Waverley Steps was replaced. At the east end of the station, Platforms 2 and 3 were extended. Work started on building a new platform opposite platform 11. To access to the new platform, a lift and staircase were built on the south side of the Klondyke wall. Platform 3 was brought into use on 11 December 2006 for Edinburgh to Newcraighall services. Platforms 10, 20 and 1 were brought into use on 27 December 2006. Associated with these works a new bay platform was constructed at Haymarket 'Platform 0', to allow some services to terminate/start there during the remodelling of the western throat at Waverley. The platform began use from December 27, 2006. Slateford Yard was also upgraded to accommodate a temporary First Scotrail servicing depot (18 month life during disruptive work at Waverley). The depot was used from 11 December 2006. Created by scot-rail admin and last modified by jamieintercity at 14:28, 19 of December 2017.